The Jolly Jumper Head Hugger Safety Support Pillow helps protect baby's head by holding it snuggly in place. A preemie pillow is included. 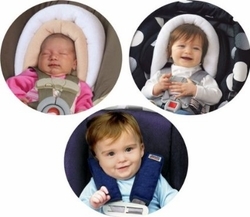 Soft straps are also included to prevent the straps from rubbing against the baby.